Surveying homeless youth, picking up trash and harvesting fruits and vegetables for the disadvantaged. These are just a few tasks more than 1,000 Johns Hopkins University students, faculty and staff will pursue on Saturday, Oct. 3, for more than three dozen Baltimore non-profit organizations. The university’s annual President’s Day of Service, now in its seventh year, will kick off at 11 a.m. at the Ralph S. O’Connor Recreation Center on the Homewood campus. President Ronald J. Daniels will address participants who will then fan out to volunteer at about 40 locations across the city. Volunteer projects will run roughly from noon to 3 p.m. Some of the organizations and sites volunteers will be helping include the Cylburn Aboretum, First Fruits Farm, the Greater Remington Improvement Association, Jubilee Arts, Micah House, Thread and the Weinberg Housing and Resource Center. First Fruit Farm: Volunteers will harvest fruit and vegetables for the ministry, which provides the produce to the homeless. 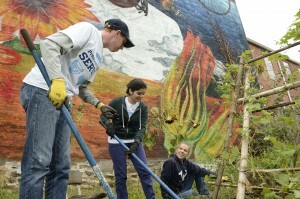 Parks and People: Volunteers will plant trees across the city. Youth REACH Resource Fair: Volunteers will assist at this event that seeks to collect information about homeless people under age 24, living alone. Recreation Festival: At this festival for people with disabilities, volunteers, including Johns Hopkins athletes, will assist with games, food and clean-up. About 150 people from the university’s East Baltimore medical campus, including the Schools of Medicine, Nursing, and Public Health, will also be volunteering at several locations. Johns Hopkins Alumni Association chapters, including those in New York City and Los Angeles, will join the effort on Oct. 3 with service projects in their cities. The President’s Day of Service is organized by the Johns Hopkins Center for Social Concern and funded by the Johns Hopkins Parents Fund. The East Baltimore initiative is organized by SOURCE (Student Outreach Resource Center). To cover the event, please contact Jill Rosen, jrosen@jhu.edu, 443-997-9906 or (cell) 443-547-8805. On-site media contact on Saturday: Gia Grier, cell: 410-733-2424. Johns Hopkins University news releases are available online, as is information for reporters. To arrange a video or audio interview with a Johns Hopkins expert, contact a media representative listed above or send an email message to Len Turner. Find more Johns Hopkins stories on the Hub.